Hello and welcome back to the Friday Fiction Feature! Tabatha here again to take you through the exiting worlds of romance, danger, adventure, and the scientific endeavors of some bad, old-fashioned bathtub gin. The first novel for today, and the inspiration for all the rest, is a new one fresh off the best-seller list, Alice Hoffman’s Museum of Extraordinary Things. It is that last part, the backdrop of New York, its crowds, its people, its bootleggers, which has inspired the theme of today’s Feature, which we continue with another tale of history, mystery, romance, and secretive affairs in Margaret Maron’s The Bootlegger’s Daughter. This first novel in Maron’s Imperfect series, which won the Edgar Award for best mystery novel in 1993, introduces heroine Deborah Knott, an attorney and the daughter of an infamous North Carolina bootlegger. Known for her knowledge of the region’s past and popular with the locals, Deb is asked by 18-year-old Gayle Whitehead to investigate the unsolved murder of her mother Janie, who died when Gayle was an infant. While visiting the owner of the property where Janie’s body was found, Deb learns of Janie’s more-than-promiscuous past. Piecing together lost clues and buried secrets Deb is introduced to Janie’s darker side, but it’s not until another murder occurs that she uncovers the truth. For a twist on the dark and secretive bootlegger story, The Bootlegger Blues brings a lighter view of lawbreaking. This new comedy by the author of Toronto at Dreamer’s Rock and Education Is Our Right is about love, family, and what to do with too much beer.A Set on a reserve, it follows the plight of Martha, a church-going, teetotaling woman who finds herself stuck with 143 cases of beer after a church fundraiser fails.A She decides to bootleg the beer, to the horror of her son Andrew, nicknamed Blue, who is a special constable on the reserve.Meanwhile, Andrew has fallen for a young woman he thinks is his cousin, and his sister Marianne is bored with her “Indian Yuppie” husband and finds herself attracted to a handsome dancer at the powwow. The pace is fast and vigorous in this romantic situation comedy. Of course all these tales of adventure may not be quite right: we know you would like a bit more realism in your literature, so how about a book that hits more close to home? Never fear, I have found the book for you! How about a novel about an academic? A novel about a troubled family? A novel about being really annoyed with your little brother? See, do we know our audience or what! Danger, excitement, and historical literary criticism, The Professor and the Bootlegger has it all! Howard Jenkins, a history professor, is immersed in the medieval world, a lover of the past, not the present. His younger brother, Reginald, is a ne’er do well who plays at being a student to please their parents. When Reginald’s gambling debts involve Howard in a bootlegging operation, Howard is blasted out of his secure academic world. Howard’s only question now is, what would King Richard do? With more murder, mystery and mayhem, Bootlegger Haze continues the adventurous theme of the day, and gives you the option of partaking in a little hazard yourself through its initial how-to for the inexperienced bootlegger. 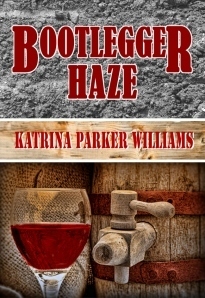 The Bootlegger Haze Series is a special two-part ebook series by southern and historical fiction author, Katrina Parker Williams. Bonus features included in the series: a southern terminology definition list and favorite bootlegger recipes from some of the main characters–August, Buford Tee, Ton Stone, Miss Carmelia, Martin, and Myra Jaye. 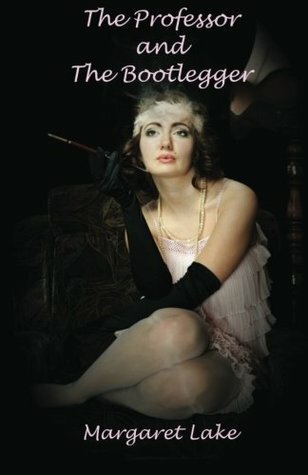 Bootlegger Haze — Book One (The Saga) is the first installment of a southern family saga, set in the mid 1800’s and spanning more than 50 years, that is sure to take you on an historical adventure of unrequited love, murder, and mayhem. We are introduced to a colored bootlegger, Buford Tee Jefferson, known for selling the best whiskey in Jones County, Mississippi. Buford Tee learns his craft from his grandfather, August Jefferson, who takes him in as a child and raises him after the murder of his mother. We meet the rest of Buford Tee’s family and follow him on his journey to become the most revered colored bootlegger in Mississippi. We also meet his love interest, Miss Carmelia Faye Lafayette, who gives as good as she gets. She is by no means a pushover, and the two of them run two of the most successful juke joints in Jones County. In the second installment, Bootlegger Haze – Book Two (The Legacy), we meet Buford Tee’s rival, Morris York, a white bootlegger who hates him for drawing away his customers that favor Buford Tee’s top-notch whiskey to York’s watered-down hooch. York’s resentment is also fueled by his recollections of his stepfather’s infidelity with Buford Tee’s mother, Marie Claire Jefferson, a union which resulted in the birth of Buford Tee. York believes his mother, who dies shortly after discovering the affair between her husband, Winston, and Marie Claire, died of a broken heart. As a result, York sets out to destroy Winston. Buford Tee is also on his hit list, although others close to him suffer his wrath. A series of mishaps, misunderstandings, and a neighbor’s mistaken identify leads to the deaths of York’s love-struck, teenage daughter, and Buford Tee’s adopted son. The teens are caught up in a battle between York’s flunkies and Buford Tee’s posse, both vying for control of the lucrative moonshine business, the consequences of which bring devastation to the small southern town. Of course, I’d hate to leave the only realism for today in the (faint) possibility of our readers using some of those curious recipes (with a licence of course), and so we’ll finish off today with a small salute to my once-notorious state. Now all Winona residents (and many of the former residents who fled to warmer climes (cough, Brandy, cough) know something about the small river town’s prohibition era notoriety and have heard some story about the painting of the woman in a 2nd street window holding a red lantern. But it is not just Winona which defied the bland-midwestern ideal as we learn in Twin Cities Prohibition. Ferret out the haunts and habits of those who kept speakeasy doors oiled and politics crooked in the Twin Cities. If you take a tour of former blind pigs today, you will probably encounter nothing more dangerous than a lifelong attraction to the 5-8 Club’s Juicy Lucy Burger, but Twin Cities Prohibition will return you to a time when honest reporting like that of Walter Liggett was answered with machine gun fire. 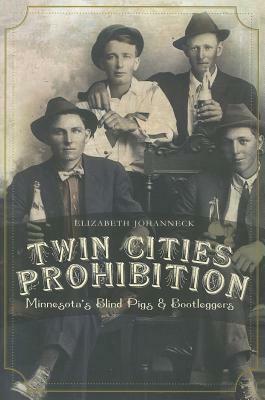 Clink glasses with notorious characters such as Kid Cann, Dapper Dan Hogan and Doc Ames, the “Shame of Minneapolis,” in Elizabeth Johanneck’s raid on this fascinating era of history.